The term indusium griseum refers to the cellular component of the supracallosal gyrus in the human. It is a thin layer of neuronal cells adherent to the outer surface of the corpus callosum and is identifiable by dissection as extending from the fasciola cinerea caudally, over the body of the corpus callosum, and around the genu of the corpus callosum and the rostrum of the corpus callosum to the paraterminal gyrus rostrally. It is one of three parts of the supracallosal gyrus; the others are the medial longitudinal stria and the lateral longitudinal stria ( Carpenter-1983; Riley-1943 ). 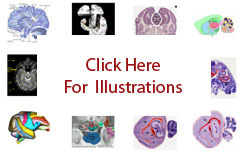 In the macaque ( Paxinos-2000 ), the rat ( Swanson-2004 ) and the mouse ( Hof-2000 ), the indusium griseum is identified by histology with stains for Nissl substance, and the longitudinal striae are not usually identified in macaque and rodent brain atlases. Thus, in those species the indusium griseum is the histological equivalent of the human supracallosal gyrus. In the rat and mouse the indusium griseum is a cell group embedded in the cerebral cortex at its junction with the corpus callosum. In rodents it extends from the fasciola cinerea caudally to the tenia tecta rostrally.